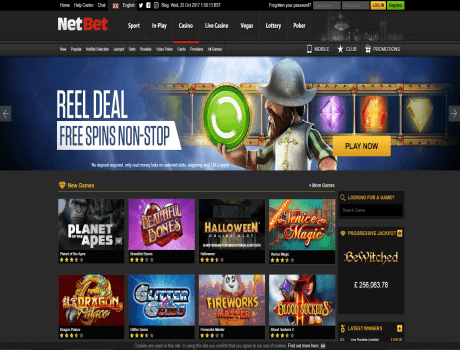 Netbet casino gives 5000 free spins for new customers, who made their first deposit. Make your first deposit into your casino account, start playing instantly with a welcome bonus of up to €200 and you will automatically be entered into our weekly 5,000 free spins raffle. Win between 5 and 500 free spins in our wednesday draw. Promotion only applies to NetBet Casino first time depositors and can only be played once per player/household/computer/IP address. Players who have made a qualifying deposit will automatically be added to the next raffle list. Draw will take place every Wednesday, and includes all eligible players who have made qualifying first Casino deposit between the Wednesday of the previous week and the Tuesday of the current week. Selected winners will be informed by pop-up message automatically set to appear once any of the games from the selection have been opened in real mode (i.e. when player is logged in to NetBet account). Free Spins will be instantly added to winners account and playable within 7 days on selected slots only: Gonzo's Quest, Warlords: Crystals of Power, Starburst, Twin Spin (including mobile version, if available). Winnings from Free Spins worth up to £250 will automatically be transferred as bonus money once all free rounds allowed have been played.